Note: This article was originally published on the 14 Nov 2018. It now includes updated information as released by Decentraland. In an official announcement by Decentraland yesterday, the second auction date has been announced as the second week in December, 2018. This auction will also come with a twist…it will be a Dutch Auction. 30/11/2018 *Start Date Update: Official start date of the auction is 10th December 2018. You can view the official countdown timer here. A Dutch auction works in reverse to the way you may have participated in an auction before e.g. eBay or a traditional auction house. There is no bidding in a Dutch auction, the price will usually start very high, and gradually decrease over time until it reaches a value somebody is willing to pay for it, at which point they make the purchase and it is removed from auction. What does this mean for the Decentraland Dutch auction? It means that once again, we are in new territory and testing what is actually possible. There are still some unanswered questions from Decentraland regarding specific details about the auction, such as how high will Decentraland start the LAND prices (*now answered below). However, with the auction only 4 weeks away, it shouldn’t be long until more information is released. Throughout the first day, the price will drop a total of 100,000 MANA. Throughout the second day, the price will drop a total of 50,000 MANA. From the third day through the eighth day, the price will drop a total of 5,000 MANA per day. From the ninth day through the end of the auction, the price will drop 3,000 MANA per day until a final price of 1,000 MANA is reached. What are some advantages of going Dutch? There are a few reasons why Decentraland might have decided to make this decision, such as reducing the threat from trolls who, in the first auction, would sporadically bid on LAND they had no intention of buying, just to, well, be a troll. A Dutch auction prevents this. Using this method will also help us further understand what the true value of LAND is in specific areas of the Decentraland map. Also, this type of auction really levels the playing field from a buyers point of view. Anybody who took part in the first auction will have no advantage in terms of strategy and experience. What are some disadvantages of going Dutch? It has been argued that this style of auction would mostly benefit whales, who have deeper pockets and can pick off the better located LANDs earlier than others, as they can afford to pay more. There is also the opinion that this method may not be as effective at attracting new members to the platform, who may have little knowledge of historical LAND prices, therefore wait too long for what they deem to be a “good” price, and end up and missing out altogether. 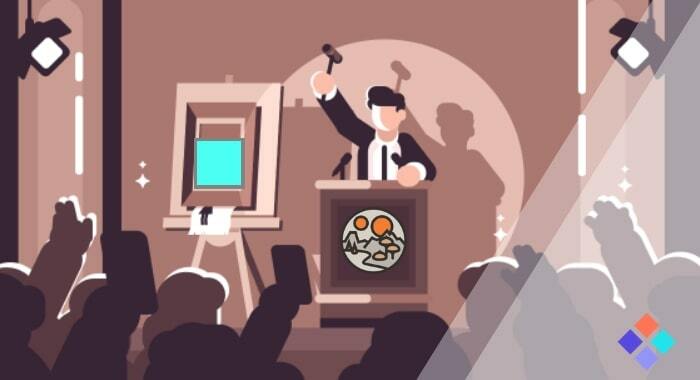 Whatever the type of auction format, the second Decentraland auction promises to really get the heart pumping. The best result for Decentraland would be to have a whole new group of first-time LAND owners join the community, each with their own ideas, enthusiasm and plans of what they will build on their very first piece of Decentraland. Good luck to everybody taking part! Will the scene limitations on ..
MANA Soars as Bulls Charge in ..